Today I am featuring another Etsy store owner. I will be talking to Michelle from Michelle and Patch. I am really happy you agreed to this interview and let me just say that I ❤ your stickers!! So, let’s chat. My name is Michelle, I have a degree in interior design and I am currently studying to become an Art and Design teacher. I love to eating, sleeping and watching Netflix. I have always had the benefit of a planner, which, in the past I used purely to keep track of appointments. I began to use my planner and calendars more heavily as I was applying to university last year. I was juggling a part-time job, work experiences, interviews and a whole host of other things. My planner became scribbled with so many notes and changes that there were some days where I couldn’t read what I was supposed to be doing. As a result, I was at times forgetting or misreading the tasks I was meant to do. It was a planning method that just didn’t really work for me. It was on YouTube that I discovered the planning community and stickers. After a bit of research, I ordered a few sticker sheets to try it out. It was a way of organising and planning that instantly clicked for me, it was clean, and instead of writing huge amounts to remind me of talks I needed to do, I could just look at a little picture. When I went looking for more stickers to add to my collection however, a lot of shops didn’t have stickers that I would have really liked. Adding to that, most of the shops that had stickers I wanted were from America so it was a long wait time for stickers arriving, and the cost of shipping as well, as the actual stickers all added up to be quite a lot of money. It wasn’t quite within my budget. I have always had an attitude of, “if I can’t afford to buy it, I will make it myself” and it’s what I did here. I illustrated a few of the icons I wanted for myself, transferred them onto the computer, printed and cut them out. At first, I only planned on using them for personal use, but people around me began to ask about them and eventually I put up my fist stickers on Etsy in May 2015. You can find a variety of stickers for planners and journaling. Stickers range from functional to decorative. These include stickers for the everyday like grocery bags and post boxes or more fun sets like the Halloween set and the getting pretty set. What are the advantages and what the disadvantages of having an Etsy store? Advantages are that the shop is entirely within my control. If I have assignments coming up or a holiday, I can close the shop and reopen when I like. It’s a great opportunity to really create a brand, going all the way from a logo to the packaging. It’s also just a great experience of being your own boss and learning every aspect of running a small business. Through social media I am able to communicate with my customers easily and very quickly with shop notices about closures or updated shipping days etc. Disadvantages are that you have to learn every aspect of running a business, I have to make sure that I price things correctly, so that what I charge covers the cost of my fees, material costs, postage and packaging and make sure that I have enough profit in order to keep my shop open. Having an Etsy shop also means that money is not consistent every week. Some weeks are incredibly busy! While other weeks are slightly quieter and it’s something you do need to keep an eye on, particularly when it comes to re-ordering supplies and you have to make sure you have enough to purchase more when you need to. Now let’s talk about planning. How do you plan? I usually plan once a week (usually on a Saturday or Sunday). I start with an undecorated page, which usually has a few sticky notes reminding me of what I have to remember to do on those days. I prefer using sticky notes as I can move them around without making a mess of my week and keep the page very clean and clear at all times. My planner is in a horizontal style and, when I start decorating, I usually split each day into 3 even sections with scrapbook paper and washi tape (I tend to be very decorative when it comes to planning). Once I have my basic layout, I use my stickers to indicate events that are definitely happening throughout the week. The rest of the individual days I fill in as I go or record at the end of the day. Ok, so where can people find you? (all social media connected to your store? Michelle sells lovely stickers. I have placed an order and cannot wait for them to get here. Like I did with FruVesas printables, I will share my spread on my blog, once I get Michelle’s sticker sheets. If you are an Etsy store owner and would like to be featured, please leave a comment below or email me at mypinkrambles@gmail.com. I hope you enjoyed this post. There are more coming. Happy planning everyone!! Thanks for sharing this useful information in the interview!!! I’m visiting! OH wow – and I thought I had a handle on planning. I really need to up my game. Great post thanks girls. So cool! 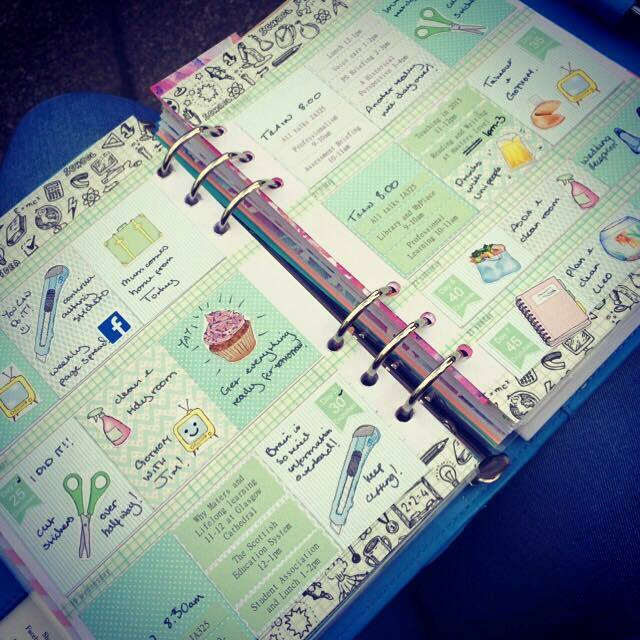 I love the planner…I’m an organization freak for sure! I am a self-professed #planneraddict and love that you showcased an Etsy sticker designer and how she plans! Etsy has the best stuff and I love finding out abut different shops.